Rowan Williams, the Archbishop of Canterbury, has written an article in today’s Guardian bringing together his thoughts and reflections on the summer riots in England. It is worth reading. The Archbishop should be commended for regularly entering into the political arena to provide a Christian perspective on current issues. Given his position as the head of the Church of England we shouldn’t really expect anything less, but he does appear to have a genuine passion for this. We could do with more Christian leaders at all levels showing a similar desire to engage with the media and increase the Church’s voice in a whole range of issues. The article raises a number of valid points and touches on a wide range of issues that could keep commentators debating for weeks. Williams is right to point out that there is no one root cause that we can deal with in a finite time scale. 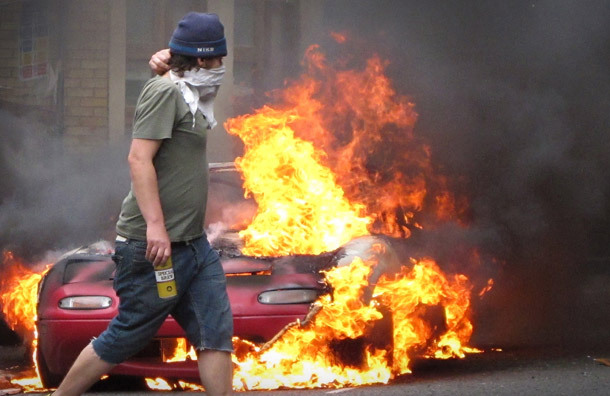 The riots seemed to embody almost everything that is wrong with our society at present; materialism, diminished respect for authority, the law, others and their property, amoral values, erosion of trust with the governing classes, disengagement from community, to name but a few. These issues and attitudes have permeated through our culture. Even the Church has been caught up in it at times. Christians are certainly not immune. Just because the majority of us who live in this country don’t go around causing criminal damage and breaking into shops, it doesn’t give us the right to take the moral high ground and demonise those who have done. If you read some interviews with those who were involved in the riots you find that not all had completely abandoned all moral sense of right and wrong. However, this moral framework they present is a twisted and confused one, not grounded in any moral structure that most people would recognise. As our Christian heritage has been eroded over the last few decades, the inevitable consequence has been the fracturing of society as relativism and the cult of the individual has taken hold. It is not surprising that some of those on the edges of society who feel rejected and disenfranchised are happy to claim something back if the opportunity presents itself. To them it is a moral balancing of the books. They are just living and acting out a more extreme version of what many others feel deep down inside. A culture of selfishness causes untold damage to society, whether it is rioting, criminality, banking collapse, family breakdown, debt or abuse. And these are just some of the more obvious examples. The good news is that the Church (or more correctly, God) has the solution. The biblical framework He has given us for life provides the answers we need. The job for Christians has two parts; firstly to live it out, and secondly to help everyone to see that the answer lies with God and not the government, or anyone else for that matter. I have one criticism of Rowan William’s article. Discussing support for young people, he mentions that “The idea that cutting the provision of youth services is ever a true economy – never mind the ethics of it – should be (but isn’t always in practice) manifestly indefensible.” Having been employed as a youth worker working both for the Church and the local authority, I’ve experience many youth services first hand. In my experience most local authority provision has been poorly delivered. It has focused more on keeping young people off the streets. It has generally targeted a very small minority (less than 1% of young people in my county) and most advice given to them has been amoral leaving them to work out important decisions for themselves. I am still waiting to meet a young person who will say that they have benefitted significantly from the now defunct national Connexions youth advice service which ran for most of the last decade. Most will have barely noticed the recent government cuts to youth provision. There is a need for youth services, but only if they provide something of value to young people. While I was a youth worker I was involved in starting a youth work charity. It was born out of our church’s desire to work with young people outside of the church who were on the edges of our community. Because its working ethos is based on Christian morals it can offer a hope and approach that the local secular services have never been able to. It has become very successful because those who work and volunteer for it have a compassion and desire to serve that comes from God. When we as a church engage with our local communities and in particular those on the edges, finding ways in which we can offer a hope of a better life, we should faithfully expect to see our society begin to find its moral compass once again.